Meet Our 2018 College Interns! Meet our new college intern, Megan Townsend. Why did you choose to apply for the Parkway Playhouse college internship? What is your favorite show/musical of all time? 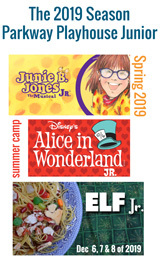 What Parkway Playhouse show are you most excited to work in/see this season? What’s happening this month at Parkway Playhouse? April 20, 21, 22 – Fiddler on the Roof JR.